The failure of the UK’s summer to get off the launch-pad required that I buy a mid-weight coat on Saturday. I selected a rather nice heavy twill cotton Pea Coat from UK retailer Jaeger. I loved the design and the price was right. However, what wasn’t so agreeable was the additional £20 I had to spend on replacement buttons – that’s not including labour. Sadly, Jaeger had done what so many brands appear to be doing, which was to over brand their own products. The buttons, perfectly serviceable in all other respects, had the company name all over them. Not so noticeable from afar, it was too obvious up close and personal. They had to go. This disagreeable trend for retailers to plaster their name and logos obtrusively over products has in recent years become a pandemic. Society in general has moved to a position where style is prized more than substance. And in so many ways much of the public and the mainstream media accept the mere wearing of brand names as a substitute for both. I suspect too that the culture of ‘Bling’ has had much to do with it. This being a direct result of the popularity of Rap, R&B and their like amongst the middle classes; with all its in your face, splash the cash, ‘how do you like them apples’ attitude to money and wealth. As to the labels themselves, you would have thought they’d know better. Leaving aside for a moment the fact that bloody great labels and logos ruin the aesthetic of a garment, one of the requirements of exclusivity and glamour is subtlety and discretion. It’s the key difference between nouveau and old school. Savile Row tailors are famous for hiding their labels inside the inside pocket of their jackets, and for not advertising. And yet we are in no doubt as to who they are, what they are and their pedigree. There is another factor to consider and that is the prevalence, even amongst exclusive labels, for outsource manufacturing to low wage economies. Such practises make the high prices charged for their goods ridiculous – if not damn dishonest – in my view. Over branding is perhaps a means for labels to sooth their own consciences, as though it were adequate compensation to the poor trusting punter; “Here you are Sir. Have a little more style by association, on us”. Curiously, in an age when most brands worry about the ready availability of counterfeit goods, over-branding increasingly makes the real thing look like the fake. 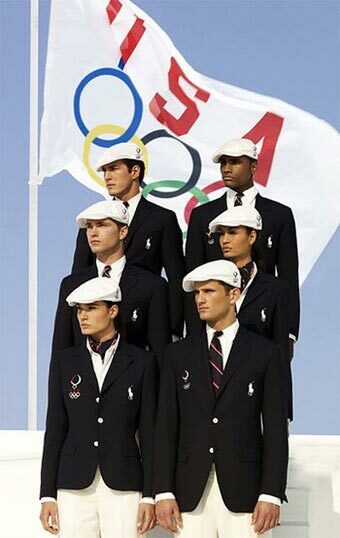 The controversy sparked by Ralph Lauren’s dressing of the US Olympic team for Beijing is well known. Those jackets looked like cheap knock-offs in my view. For another example take Ray-Ban Wayfarers, the ultimate pair of bins in my view. But unless I want to pay inflated prices for a pair of vintage glasses I have to have a silly – and quite possibly irritating – ‘Ray-Ban’ scrawled across the lens. So, I buy the fakes instead, or rather an interpretation by a more subdued retailer. Time to draw stumps on this rant, but I’ll end by saying I object to the fact that having paid for a garment I am then expected to provide free advertising as a human billboard. The great irony in this particular case is that I really love the phase that Jaeger is going through at the moment; and if anybody were to ask I’d happily tell them where I bought the coat. I suspect that is true of most people in most other cases. At least there are still manufacturers that aren’t giving in to the hype. For instance Sunspel do not brand their polo shirts at all. I like that. I must, however, disagree with the parallel you draw with Savile Row. That’s a different game entirely. If I want my bespoke clothing without labels, my tailor will do that. The point is, that confection clothing doesn’t offer that option (well, any option really, take it or leave it)and you have to search out the brands that haven’t lost track of what it is about: their product, not their name. The logo on the blazer is vile. Designers that plaster their signature on clothing to its aesthetic detriment should be ashamed of themselves. However, the blame shouldn’t all be levelled at such designers; the logo hungry public are gauche and demand that the expense of their wardrobe be exhibited. I was in the Ralph Lauren store when a middle aged man declined a logo-less jumper because “no one could see it was Ralph Lauren.” It’s the same with Ralph’s Wimbledon gear – excellent mock-ups of Fred Perry era tennis clothing but the ubiquitous Polo logo, as if it wasn’t ubiquitous enough, plastered all over the place. Ridiculous too considering that the logo depicts a completely different sport. It would be easy to think that Lauren himself is responsible for these abberations (as Chairman and CEO, he ultimately is) but there is the corporate machine of POLO RL that demands it; RL has shareholders after all. It wouldn’t surprise me if more tasteful plans had been botched at the last minute by someone who said; “Hey, where’s our logo on these jackets?” Whoever is responsible should know that ‘advertising’ in such a tasteless fashion is actually counterproductive. You don’t need a logo with a big name to justify the aesthetic product. This is, in my opinion, part of a broader issue with modern Anglo-American business practise; that of trading on a brand association alone based on past quality. I feel strongly that the problem lies with the companies themselves which see the opportunities for maximising profits rather than maintaining their reputations among their core market. What will happen in the long term? The spokespeople of style will abandon these big names for companies that offer style and quality at rational prices now, as you did with the Wayfarers, leaving the reputations of these big brands bankrupt in the future. Short-termism is the ideology of the Western board room. I avoid buying any clothing with obvious branding or logos, even tee-shirts or the Polos with the embriodered polo-player, lizards, etc….yes, you know who you are. But yes, I tend to agree that the vast herd of the bourgeoisie DEMAND branding to establish their “taste” or their place in the consumerist-collective. Even if it’s a cheap knock-off or knock-down…as long as it has the all-important label. I could not agree with you more. I live in America and I suffer from the kind ridicule that is by product of over branding. There are so many clothing companies from the High End to the Low End that are branding their product to such a degree that is downright obscene! Like yourself I have come across pieces which I wanted to purchase but stop short of because the buttons were branded. I agree with Derrik Ollar, they should be paying me to wear their shirts with their logos. It is funny that an article criticising clothes with brand names all over the place, is put on a website full of ads, some in the text itself. Criticism acknowledged but you should know that there is a huge difference between webzines and clothes.